Some quick thoughts on the Glenfarclas 30 year Single Malt. Owned by J. & G. Grant, this Speyside distillery has a long history dating back to 1787 as illicit still in Ballindalloch. It came into the Grant family’s possession in 1865 when John Grant bought it and hired John Smith, formerly of Glenlivet, to manage it. Today it is ran by the sixth generation of the Grant family. The name “Glenfarclas” means “the valley of the green grass”, refering to its location in the valley at the foot of Ben Rinnes with the mountain’s snowmelt being the key water source of the distillery. According to Charles MacLean’s Whiskeypedia, the distillery is noted for having the largest stills in Speyside that are fueled by direct fire as opposed to gas. In 1968, it was the first to release a cask strength single malt. It was awarded Distiller of the Year in 2006 by the Icons of Whiskey Awards. The whiskey is aged in majority ex-Oloroso Sherry casks with about third aged in ex-bourbon cask. Beautiful dark color. Hugely aromatic nose with lots of spice and brown sugar. It makes me think of cooking gingerbread cookies at Christmas time. The sherry wine notes are present but they smell richer and deeper than typical sherries–more PX than Oloroso–with dried raisin and Turkish coffee aromas. The palate is delightfully seductive. Creamy and silky with lots of weight. The spices carry through to the palate but the brown sugar and Turkish coffee aromas seemed to have morphed more into a rich, dark chocolate note that is far less sweet than what the nose suggested. The long finish delivers a load of freshness like freshly brewed herbal tea that was unexpected and entrancing. A bloody fantastic dram! It’s a bit pricey at around $437 on Master of Malt but it is simply exquisite. I would say the cost is justifiable if you think of the years of pleasure you can get nursing it but it is so utterly scrumptious with its combination of power, depth and freshness that I fret the bottle wouldn’t last long in anyone’s house. Tagged Charles MacLean, Glenfarclas, Glenlivet, Icons of Whiskey, John Grant, John Smith, Master of Malt, Robert Hay, Single Malt Scotch, Speyside, Whiskeypedia. 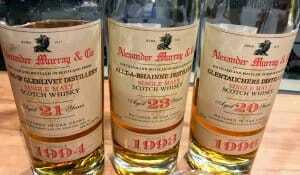 Some quick thoughts on a few Scotch whiskeys from independent bottler Alexander Murray. Founded by Scottish native Steve Lipp in 2004, Alexander Murray is a notable source behind many of the private label Scotches found at Costco (Kirkland Signature) and Total Wine & More (Ainsley Brae). 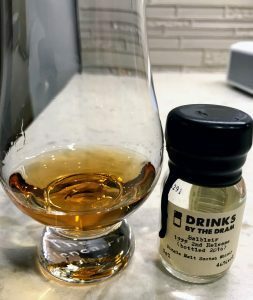 The 20 yr Glentauchers is a really light and elegant, floral “breakfast Scotch”. Something between a Glen Moray and Glenfiddich style. Around $150 a bottle which is a bit high for this light style, in my opinion. The 23 yr Allt-a-Bhaine (used by Chivas in their high end blends) has a good balance of malt with light peat–sort of a more powerful Oban. A lot of layers and complexity with a long smooth finished. Around $150 a bottle which is an outstanding value for a 23 year that easily outclasses many 21 yr whiskeys in the $200+ range. 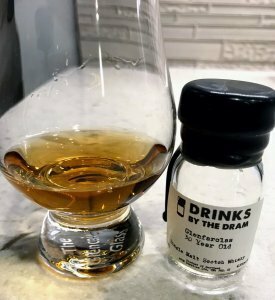 The 21 year Braes of Glenlivet is a bit shy on the nose but had good weight on the palate. Nothing like regular Glenlivet. Rather more like a Fine Oak Macallan. Around $180 a bottle which is a little too much for my taste. The 19 year Cask Strength Linkwood is a much spicier and more powerful driven Scotch then typical Linkwood. I strongly suspect Sherry casks. This is like a Macallan 18 yr but with way more depth and power. It holds it proof really well for a smooth finish that doesn’t need to be watered down. Around $150 a bottle which is an outstanding value especially considered the Macallan 18 is around $230. The 26 yr Bunnahabhain is very savory and meaty. More in a Mortlach or Glenfarclas style than anything I tasted from Bunnahabhain. Something to contemplate over while rolling it around your tongue. 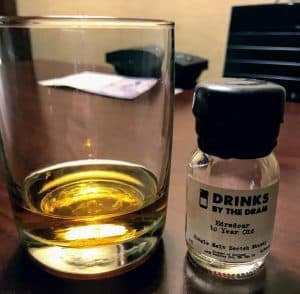 Around $290 a bottle which is a bit steep but I can’t deny the uniqueness of this expression of Bunnahabhain. The 28 yr Cask Strength Bunnahabhain is classic Old School Bunnahabhain before they started adding more peat. 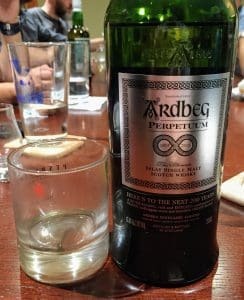 A touch of peat but it’s all about the beautiful dried fruit, fresh cereals and long, subtle spice on the finish. Very smooth for a cask strength. Around $320 a bottle which is certainly because of its age. It’s a very tasty whiskey that delivers a lot of pleasure but you’re going to pay a premium for it. Tagged 60 Second Whiskey Review, Ainsley Brae, Alexander Murray, Allta-a-Bhaine, Braes of Glenlivet, Bunnahabhain, Chivas Regal, Costco, Glen Moray, Glenfarclas, Glenfiddich, Glenlivet, Glentauchers, Independent Bottler, Kirkland Signature, Linkwood, Macallan, Mortlach, Oban, Scotch, Single Malt, Total Wine & More.